FOSTER UPDATE: While still in the puppy stage, Windi is smart and obeys the command ‘leave it.’ She is crated a couple of hours a day during the foster parents’ absence. 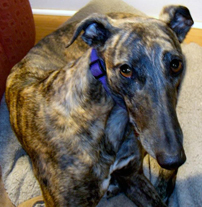 Windi is outgoing and affectionate to everyone she meets and is not bothered by loud or unexpected noises. She will bark if she hears someone at the door or in the yard, or if a coyote is present. Windi is house trained without benefit of a doggie door. She is healthy and has a good appetite, without any food-related issues. 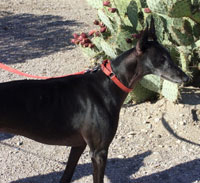 Windi walks nicely on the leash, enjoys car rides, and is accepting of grooming and handling. She knows her name and will come when called. Windi loves her toys, appears to like small dogs, and doesn’t bother her kitty roommate. She is a very loving dog that will put her paw in her human’s hand for a massage. FOSTER UPDATE: Although still a little shy, Dream is a sweet energetic boy, coming out of his shell and enjoying the benefits of home living. He’s smart and has learned to navigate stairs, loves his doggie door, rides in the car, and relishes romps at the doggie park with other dogs. He’s still a little skittish around people but, once showered with attention, he warms up quickly. He is a little competitive for attention with his doggie roommate so being an only fur kid might be good for this fabulous boy. 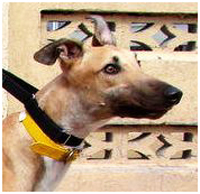 Dream lives with two cats and has interacted with small dogs without any problems. Dream is alone 8 hours a day with his fur buddies and has not been destructive. He is occasionally crated for a short time and this does not bother him. No health or food issues are apparent. Dream is ready for his forever home. 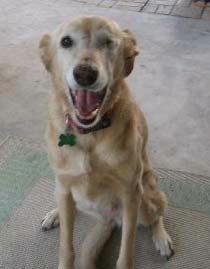 FOSTER UPDATE: Love bug Kara – who responds to Deirdre - is happily adjusting to home living. House trained, using a doggie door, laying in the sun with her toys in the back yard is a favorite pastime. Kara has an affinity with small children, allowing them to hug her around the neck and she reciprocates by kissing their faces. She walks well on the leash but becomes reserved when walking past fenced barking dogs, and leans into her human when cars pass them. When the vacuum is in motion, Kara scoots through the doggie door. Enjoys a car ride and does not bark. 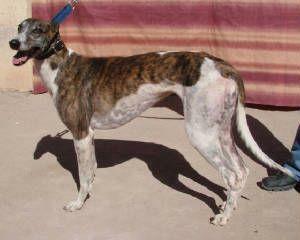 Kara is not crated and the foster mom closes doors to other areas in the house to reduce temptations. She eats well, is in general good health, and enjoys being groomed. Kara responds to the tone of voice and comes when hands are clapped and her name is used. My Oh My. What an upgrade. My own doggie flap, clean rugs, great kibble and lots of hugs and kisses from AGR volunteers. My name is Hallie. 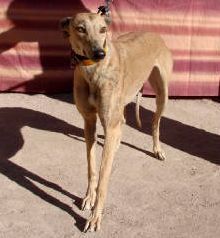 I'm a small fawn brindle gal that's a little shy because I'm new to the Greyt Hacienda, but I'm getting into the swing. I'm a cute, affectionate pooch that responds well to kind, gentle people. 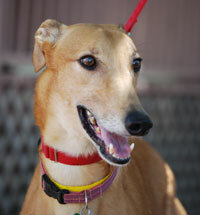 I'm easy to handle, get along with other dogs, and I'm smart, so training me to fit into your home will be a breeze. Cats, however, are not on my wish list as a companion. They smell different to us greys and when they bounce and scamper around, they remind me of this 'thing' I used to chase when I was racing. But if you don't have kitties and perhaps another dog to romp with, I will blend right in and you will be my rescue angel. FOSTER UPDATE: Classy is enjoying time with a family that is kind to her. She was underweight and, at first, terribly shy but gradually she is gaining a little weight, learning to trust people and soak up affection. Sometimes Classy gets a little ‘pushy’ with Cherry, her Alpha greyhound roommate, but Cherry promptly puts Classy in her place. Classy lives with a couple of parrots and, while curious about these feathered residents, she has not tried to pursue them. Mischief gleams in her eyes as she plays with toys. Classy barks very little, and is not disturbed by loud or unusual noises. She is house trained using a doggie door and is not destructive in the home, so she is not crated. Classy is learning her name and the commands ‘come’ and ‘no.’ She is learning to walk on a leash and acclimating quickly to rides in the car. My name is Tusk. A powerful name but I'm really a push over. At 2-l/2 years of age, I'm energetic and playful and I tolerate cats. Not sure how to play with a cat, but I don't mind snuggling on my doggie bed with kitty as long as kitty 'gets it' that most of the bed space is mine. My left ear occasionally bends to the right. No, I'm not hitchhiking for a lift in a car to reach some far away destination. It's another way for me to keep track of what's happening outside my visual capabilities. I'm in good physical shape, easy to handle and possess a sweet disposition. The holidays are nearly here. 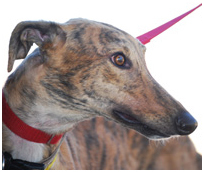 What better gift for a family than a retired racing greyhound. Where are my doggie toys? I'm Binky and I turn two in February. Just like human toddlers, a toy or a blanket is an absolute must for us youngsters. This afternoon, the volunteer lady tossed me a couple of blanky toys and I was one happy camper tossing, chasing and chomping as I sped down the sprint run. I'm a playful pooch with a sweet disposition and cat tolerant. I'm easy to handle and love physical attention, especially kisses to my face and strokes under my chin. I'm in great physical shape and eagerly await that special person that will take me home. A sturdy doggie bed, loads of toys, premium chow, regular exercise and I'm yours. Once you and I get acquainted, you'll not be able to resist me. FOSTER UPDATE: Shy is not in Mickey’s vocabulary. 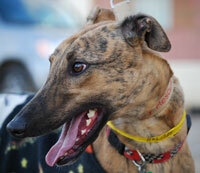 He is one smart greyhound that gets along well with people and his two greyhound foster brothers. As he tested ‘not cat tolerant,’ a home with kitties is not advisable. 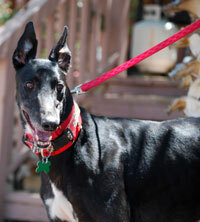 Mickey is house trained; rides well in the car and loves his daily walks. He does not pull on the leash but tends to zigzag, exploring new territory. When left alone occasionally without his two doggie companions, he did not become agitated, so he is not being crated. Mickey is in good health, does not steal food, and is not spooked by unusual noises, other than the vacuum cleaner! Mickey accepts grooming, knows the command ‘settle’ and also knows his name. He will come when called, if he feels like it! Mickey is a sloppy eater and drinker so a towel under his bowls might be a good idea. FOSTER UPDATE: Dilly is living with other large dogs and relishing home living. At first, a little shy of strangers, Dilly warms up quickly and becomes very affectionate. Loud noises may startle her, but she is used to the vacuum. She is a good traveler, barks rarely and has learned the doggie door. She accepts crating up to 4 hours a day. Dilly is in good health with no food issues. She enjoys her morning romp but shows prey behavior toward small dogs, so she's probably not cat or small dog tolerant. Dilly accepts grooming and has learned the commands 'leave it' and 'no.' 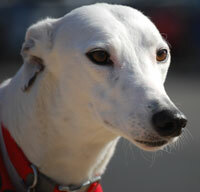 Possessing a roman nose, rare for a greyhound, and expressive eyes, she is a canine Sophia Loren. This is one smart and affectionate hound. She would do best in a home with another dog for company. My name is Mazzie. I am a young, gorgeous red female. I'm just waiting for some loving soul to take me home and turn me into a princess and spoil me to bits. 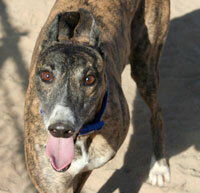 I'm young and lively and very affectionate, but I need training on how to behave in a home. I have learned about soft toys and can entertain myself by tossing and chasing these puppies until the Arizona sun slides into night. I am so darned cute, that I don't think you can resist me. FOSTER UPDATE: If you’re seeking a calm female with a shiny black coat who likes to give kisses, Idler will make a fabulous fur companion for your family. She loves kids and people of all ages. 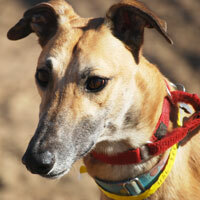 Idler is a sweet tempered, affectionate and inquisitive hound and not destructive in the home. She is house broken using a doggie door, has impeccable house manners, and does not try to get up on furniture. She walks well on a lead and enjoys her morning walks. She is in foster with a Scottie [28lbs.] a young Great Dane, and several greyhounds. Munching on marrow bones and bully sticks are two of her favorite things. She would do best in a home with another pooch for company. FOSTER UPDATE: Velvet has proven quite the chatter queen when she’s hungry. A ROO and a little mouth action makes it look as though she’s talking, and a few paw nudges persuade her foster Mom it’s time for chow. 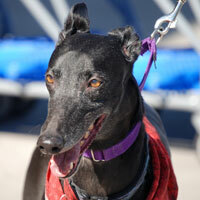 Velvet lives with other greys and a child  without any problems. She is a very good watch dog for those that venture into the back yard unannounced, and will bark and occasionally try to nip what she considers intruders. Velvet is an affectionate gal and will regularly let her foster parents know when she wants to be petted, but she’s not a pest. She usually hangs out with her people in whatever room they happen to be. While Velvet will growl at another dog that gets in her space, a hefty ‘HEY’ calms her right down. 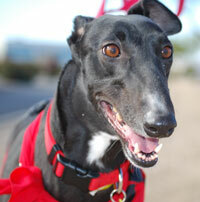 Velvet is doggie door house trained and ready for that special someone to take her home. 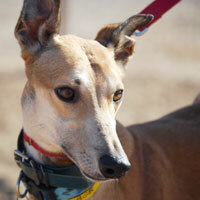 I'm a small fawn female with gorgeous brown eyes called JoJo. I passed cat testing so I'm classified as cat tolerant. Just as long as Kitty doesn't eat out of my food bowl, we'll get along just fine. I have a sweet disposition, like people, and love to play. I know that I would love to explore the Arizona desert and washes on daily walks as long as the snakes are snoozing and can't hurt me. 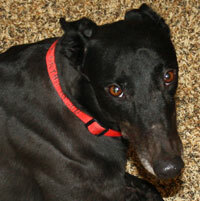 As another new arrival to the Greyt Hacienda straight from the track, I've discovered Kongs. Oh boy. I just love to nose those things all around my condo until I dig out all the biscuits. It's become quite an obsession with me, so when you take me home, please have a stuffed Kong waiting for me. Then I'll know that you want me to stay with you for life. FOSTER UPDATE: Fiona is a fun-loving, affectionate girl that knows her name and obeys the command 'sit.' In the home, Fiona is docile, house broken, cat tolerant, not destructive, and can be left alone for a few hours without suffering separation anxiety. However, she is terrified of thunder and fireworks. Fiona only has sight in her right eye so she may feel insecure and this will explain why she pulls on the leash in unknown territory where there is heavy traffic and strange dogs, although she is slowly improving. Fiona needs her space when eating and will growl at other dogs if they come too close to her food bowl. For a potential adopter with a large yard where Fiona can play with squeaky toys and another dog for company may be sufficient exercise for this sweet girl and avoid any anxiety she has with the outside world. FOSTER UPDATE: Amado is a fun-loving dog that is happy and content. He views himself as an alpha-male so he could be comfortable as the only fur kid in the home as long as his adopter is home most of the time, or with another dog for company when his people are absent from the home. 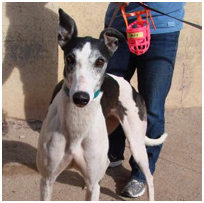 Amado loves people and approaches them to get petted. He wants to be where his people are and he's very curious about new places, sounds and smells. Thunderstorms or unusual loud noises do not faze him, he rides well in the car, and is house broken using a doggie door. He loves his daily walks and responds to the commands 'wait' and 'leave it.' Amado is a direct communicator: he makes his needs known through barking. FOSTER UPDATE: Bandit is a real charmer and adapting well to home living. 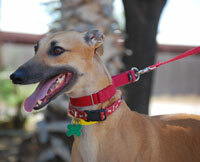 He is a gentle, happy, playful dog that loves his squeaky toys and will play fetch. He is fascinated with his reflection in the mirrors and likes to put his head on his foster mom’s shoulder. 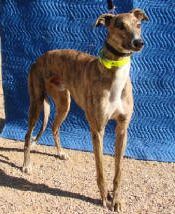 He plays well with the other greyhound in the home, loves his walks, does not pull on the leash and rides well in the car. Bandit has a prey drive and chases rabbits and birds, and when the neighbor’s dog had the cheek to come into Bandit’s yard, he chased the dog out PDQ. Bandit knows his name and will usually come when called. Bandit loves everyone including kids. Loud noises startle him a little but he’s figured out that the T.V. is not ‘out to get him,’ and enjoys watching Animal Planet! 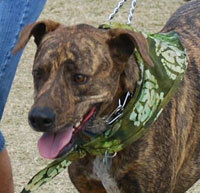 FOSTER UPDATE: Cheetah is a handsome, playful, affectionate dog that loves to visit with people. He is very loving and likes children, but a home with very small children might not work as he is very large and, while playing, could inadvertently topple a toddler. Cheetah appears oblivious to loud noises but has yet to experience a thunderstorm. He barks very little, usually when he’s playing with his doggie roommate, rides well in the car, and is house trained with or without access to a doggie door. Cheetah has a crate that is left open and he traipses in and out as he pleases, or snoozes on doggie beds. He’s a good eater and no food issues have been noted. Cheetah walks well on the leash without pulling and loves to be groomed. He knows his name and comes when called. 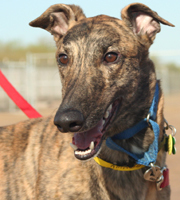 This boy has no bad habits – just needs a loving home. Phew, my life is a whirlwind. I'm Turbo. I was just starting to get acquainted with my greyhound neighbors at the kennel, when this woman breezed in, threw a Martindale leash on me, told me I was going into foster, and whisked me into a vehicle. I enjoyed the ride and when we stopped, I was introduced to Beamer - the resident Alpha greyhound - and three smaller critters; two of which have legs shorter than my ears. My new digs has loads of soft doggie beds but I spotted a huge doggie bed that was perfect for my large frame and up I jumped. Then I heard, "Off." Did she mean me? Surely not. "Off, that's my bed." Yep, I guess she meant me, so off I got. Stay tuned for my adventures in foster land. Hello Tucson. I'm Alphie. 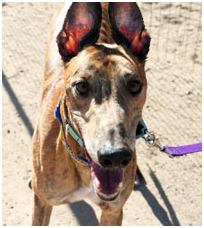 I'm one handsome large fawn greyhound with a fabulous black tail that comes in handy as a rudder when I'm zooming around a doggie park and need to slide into 'stop' mode. While not one to boast, I have to admit that I'm one smart greyhound. This morning I was placed in the meet and greet to run. Yea, that was fun, but it was more fun to open the pen gate and trot back into the kennel, unaccompanied! You should have seen the faces of the volunteers. Talk about a jaw dropper. What a hoot. Yea, I was chastised, but hey, it's their job to anticipate how smart I am, don't you think? I would prefer to live in a home with other dogs for company, but no cats. I just 'don't get' those fur balls that consider themselves superior to us greys. 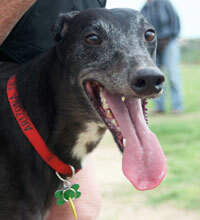 FOSTER UPDATE: Daq's loving and joyous personality is infectious. He makes us laugh every day with his goofy antics and outstanding good nature. He's got no interest in being the alpha dog; rather, he's a good-time guy and wants to get along with everyone. Almost two years old, he's an active playful dog and would do well in a home with other dogs or sturdy older kids to play with. He's so carefree and rugged that words alone don't always register on his radar but a firm gentle touch works wonders for discipline, since he's so eager to please and will gladly go into a crate, if need be. DAQ is potty trained using a doggie door. 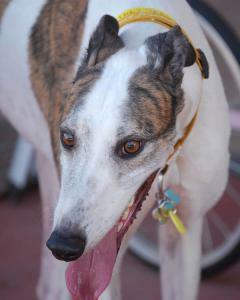 He's charmed us and our other greyhounds. We'll miss him dearly when he's adopted, but he's ready for that forever home! I'm one happy outgoing tail wagger that loves to play with other dogs. They call me Star. I'm very affectionate and enjoy being around people, so petting me is a must to keep my tail wagging. I'm also cat tolerant so kitty and I will make a good twosome. We might even do a little soft shoe shuffle close to dinner time so you will give us extra treats. I'm in great physical shape, weigh 81 lbs. and have a hearty appetite for premium chow. I love to snooze on my back with my legs splayed - we greyhounds call that roaching - it means we are contented and relaxed. So if you're looking for a well adjusted roaching greyhound, I'm your boy. My name is Sketch. I enjoy walks, riding in the car and smiling. 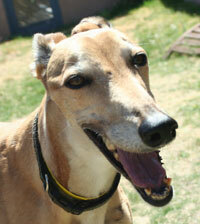 I smile a lot because I am an exuberant and happy hound! I am house trained and know how to use a doggie door. I do best with company, so ditto to what my buddy Donnie said! Hi. My name is Donnie and I enjoy walks, hanging out with my human friends and being coddled. I'm also house trained. And I will tell you that Sketch is my buddy and we would love to be adopted together! You have room in your heart for two hounds, right?